The Catalan coast, as most of the developed Mediterranean coastal zone, can be characterized as a high-risk area to the impact of storms due to the large concentration of values together with the dominance of eroding shorelines. In consequence, any long-term coastal management scheme must include a risk analysis to permit decision makers to better allocate resources. This can be done in a nested approach in which hotspots are first identified along the coast at a regional scale and secondly, they are further analysed to produce dedicated risk reduction strategies. In this work, we apply the methodology developed within the RISC-KIT project for identifying and analysing coastal hotspots in the Catalan coast as a test for applying it to Mediterranean conditions. Obtained results show that this methodology is very efficient in identifying hotspots of storm-induced flooding and erosion at a regional scale. The adoption of the response approach resulted in the direct assessment of the hazards' probability distributions, which allowed for the selection of the severity of the hotspots to be identified. When a given coastal stretch behaves as a hotspot for both hazards, it is identified as a very highly-sensitive area to storm impacts. In the study area, the Tordera Delta possesses this condition of very high “hotspotness.” This has been demonstrated by the large and frequent damages suffered by the site during the past decades. The paper analyses different aspects related to the risk management of this area, including stakeholder actions. 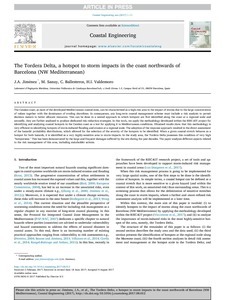 Jimenez, J.A., Sanuy, M., Ballesteros, C., Valdemoro, H. The Tordera Delta, a hotspot to storm impacts in the coast northwards of Barcelona (NW Mediterranean). "Coastal engineering", Abril 2018, vol. 134, p. 148-158.